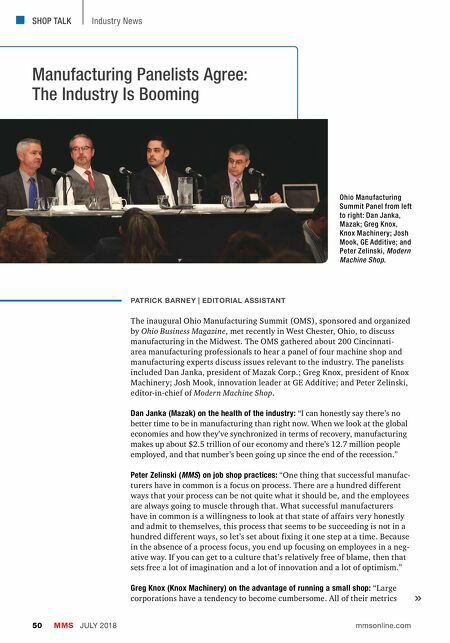 SHOP TALK MMS JULY 2018 50 mmsonline.com Industry News Manufacturing Panelists Agree: The Industry Is Booming PATRICK BARNEY | EDITORIAL ASSISTANT The inaugural Ohio Manufacturing Summit (OMS), sponsored and organized by Ohio Business Magazine, met recently in West Chester, Ohio, to discuss manufacturing in the Midwest. The OMS gathered about 200 Cincinnati- area manufacturing professionals to hear a panel of four machine shop and manufacturing experts discuss issues relevant to the industry. The panelists included Dan Janka, president of Mazak Corp.; Greg Knox, president of Knox Machinery; Josh Mook, innovation leader at GE Additive; and Peter Zelinski, editor-in-chief of Modern Machine Shop. Dan Janka (Mazak) on the health of the industry: "I can honestly say there's no better time to be in manufacturing than right now. When we look at the global economies and how they've synchronized in terms of recovery, manufacturing makes up about $2.5 trillion of our economy and there's 12.7 million people employed, and that number's been going up since the end of the recession." Peter Zelinski (MMS) on job shop practices: "One thing that successful manufac- turers have in common is a focus on process. There are a hundred different ways that your process can be not quite what it should be, and the employees are always going to muscle through that. 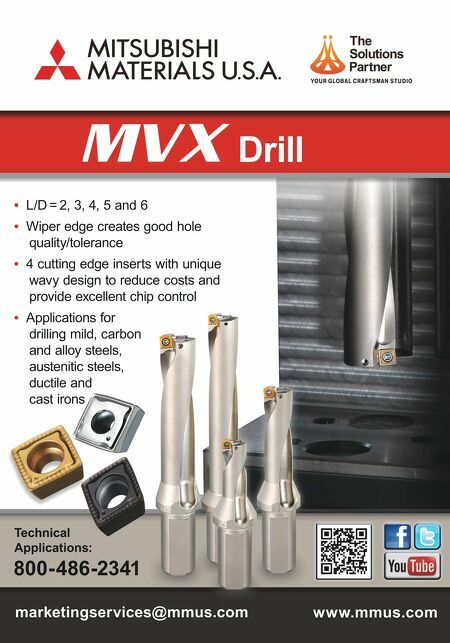 What successful manufacturers have in common is a willingness to look at that state of affairs very honestly and admit to themselves, this process that seems to be succeeding is not in a hundred different ways, so let's set about fixing it one step at a time. Because in the absence of a process focus, you end up focusing on employees in a neg- ative way. If you can get to a culture that's relatively free of blame, then that sets free a lot of imagination and a lot of innovation and a lot of optimism." Greg Knox (Knox Machinery) on the advantage of running a small shop: "Large corporations have a tendency to become cumbersome. All of their metrics Ohio Manufacturing Summit Panel from left to right: Dan Janka, Mazak; Greg Knox, Knox Machinery; Josh Mook, GE Additive; and Peter Zelinski, Modern Machine Shop.